Diamond Waste Services, Inc. offers dumpster rental and specialty waste removal service for the safe and lawful disposal of solid wastes that are sometimes encountered during construction and demolition (C&D) projects. Certain wastes pose a substantial or potential threat to the public health or the environment and cannot be disposed of by common methods. The main thing you need to know: these materials may not be acceptable for normal landfill disposal or incineration. Special handling, transport and documentation for the disposal of certain wastes is required by law (varies by waste type and jurisdiction). Diamond Waste Services, Inc. is able to safely remove these materials and provide your project with the appropriate disposal documentation required by law. This service is only available through special pre-arranged agreement. Please contact Diamond Waste to make special arrangements BEFORE loading any of these materials into our dumpsters. In some cases, Diamond Waste may NOT be able to haul your waste. Please contact us today to schedule service or to find out more about how Diamond Waste can handle your specialty waste disposal needs. The following guide provides basic information concerning hazardous wastes sometimes encountered during building demolition or site preparation work. These wastes are NOT acceptable for general landfill disposal using one of our roll-off dumpsters. Special permits and handling are required. Coal tar creosote is a wood preservative. It is a thick, oily liquid typically amber to black in color. The main use of creosote is to preserve wooden utilities/telephone poles, railroad cross ties, switch ties and bridge timbers from decay. The United States Environmental Protection Agency has stated that coal tar creosote is a probable human carcinogen based on both human and animal studies. Tires are not desired at landfills. Their bulk, which includes 75% void, quickly consumes valuable landfill space. Tires can also trap methane gases, causing them to become buoyant, or ‘bubble’ to the surface. This ‘bubbling’ effect can damage landfill liners that have been installed to help keep landfill contaminants from polluting local surface and ground water. Shredded tires are now being used in landfills, replacing other construction materials for a lightweight backfill in gas venting systems, leachate collection systems, and operational liners. Shredded tire material may also be used to cap, close, or daily cover landfill sites. Tire stockpiles also create a great health and safety risk. Tire fires can occur easily, burning for months and creating substantial pollution in the air and ground. Tire piles also provide harborage for vermin and a breeding ground for mosquitoes that may carry diseases. Soil pollution can result from damaged underground storage tanks, application of pesticides, percolation of contaminated surface water, oil and fuel dumping, leaching of wastes from landfills or direct discharge of industrial wastes. The most common chemicals encountered are petroleum hydrocarbons, solvents, pesticides, lead and other heavy metals. Contaminated soil poses a potential health risk due to direct human contact with the contaminated soil, vapors from the contaminants, and from secondary contamination of nearby water supplies. Dredge spoils may contain toxic chemicals (including heavy metals and PCB) from bottom sediments. Testing of dredge sediment will determine toxicity levels to assure proper disposal takes place. Asbestos is a mineral fiber used in building materials such as insulation, plaster, floor or ceiling tiles, plaster, ductwork, roofing shingles, adhesives and others. These materials are referred to as "asbestos containing materials" or ACM's. Airborne dust from asbestos fibers is a health hazard. There are two classifications of ACM's: friable and non-friable. In general, friable asbestos is the more dangerous of the two. Defined as an ACM containing more than 1% asbestos which can be easily crumbled, pulverized or reduced to powder by hand pressure, when dry. This is the more dangerous type of ACM. Microscopic fibers are easily released into the air where they can be inhaled and cause illness. The use of friable ACM's was banned in 1978, however they are found in buildings of older construction. Please Note: Diamond Waste does not dispose of Friable Asbestos. Defined as an ACM containing more than 1% asbestos which is NOT able to be crumbled, pulverized or reduced to powder by hand pressure, when dry. This is the less dangerous type of ACM and is generally a material which encapsulates the asbestos fibers in cement, plastic or asphalt so they are NOT easily released into the air. Some non-friable ACM's can become friable over time as they age and wear or when subject to renovation work or demolition (where cutting and breaking can release large amounts of dust into the air). The EPA defines two categories of non-friable ACM: Category I and Category II. Any asbestos-containing resilient floor covering, mastic or asphalt roofing product that contains more than 1% asbestos. Category I ACM is pliable (not brittle), breaks by tearing rather than fracturing, and does not easily release asbestos fibers upon breaking. Category I materials must be removed from a structure before demolition if they have become friable through damage or are likely to during demolition. Generally, any kind of non-friable ACM that is not covered under Category I. This includes rigid exterior siding and boards known by the trade name "transite". Category II ACM is not pliable, breaks by fracturing rather than tearing, and does release some asbestos fibers upon breaking. Category II materials usually must be removed from a structure before demolition, and they must be wetted to prevent dust and placed in covered containers. 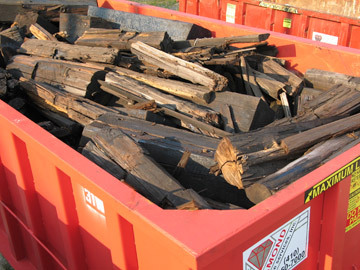 Creosote lumber requires special disposal arrangements. 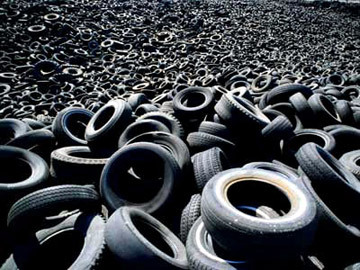 Tires are not desired at landfills because they are mostly void space. Shredding is the preferred method of disposal. 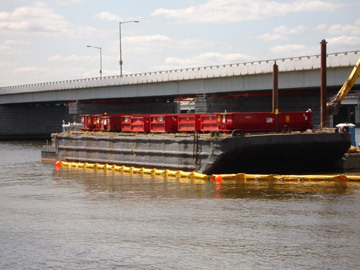 Potomac river sediment dredging operation in Washington, DC. Diamond Waste roll-off dumpsters were loaded onto a barge for filling, then transported to land for waste removal hauling.